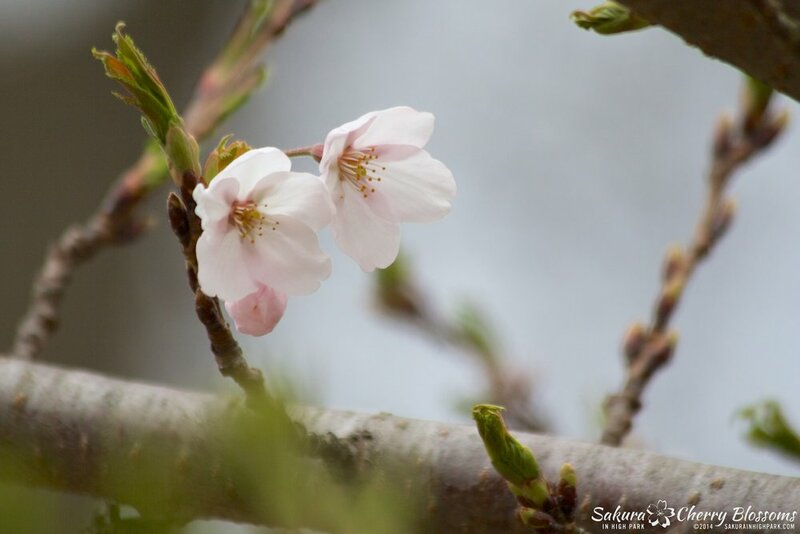 Sakura Watch, May 9, 2014 - Blossoms have begun to open! Sakura Watch, May 9, 2014 - Blossoms have begun to open! The long wait for the Sakura // Cherry Blossoms to start opening has finally happened today in High Park. Today we see only a handful of open blossoms scattered throughout the park. Currently, the best place to see a group of blooms are on the trees that line the right side of the road as you walk/drive towards the trees on the big hill and winding path. Only a scattered few blooms are open in this area, especially the trees closest to the road. The disappointing side is many tress in this area are showing much more leaves then blossoms opening up. This is a result of the bad winter and we can expect to see scattered blossoms on these trees over the next week. Also, Be warned there are many pests in this area right now as you can see dozens of holes in the ground - I think are yellow jacket wasps so be careful with pets to kids especially in this spot! These are the best spots to see the early openers right now. These trees are only in small groups of 2-3 with some close to the road, others more rooted in the woods. One large Sakura is prominent atop a hill of the left side of the road. Most of these trees also show signs of leaf growth instead of blossoms. 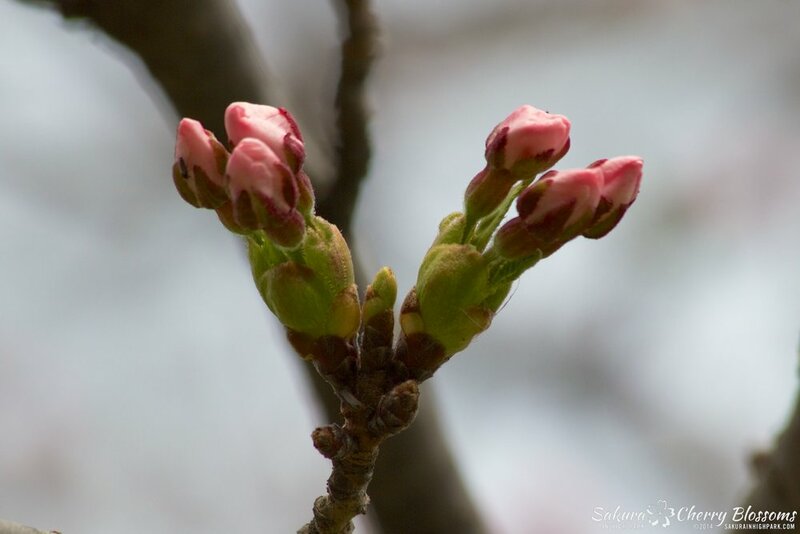 Many buds are also still in earlier stages with some of their pink petals starting to show and may take a few more days to open up. Most of the other trees are also showing signs of leaves opening. Only blossom visible is on the trunk of one tree. Many buds are showing big bulbs of pink and white. Many buds have turned to leaves in the trees in this area. Why so many leaves instead of blossoms this year? The loss of many blossoms this year is due to the severe cold & prolonged winter which prevented many of the blossom buds to develop and instead promote going straight to leaves instead. So visitors to the park this weekend will finally have their first glimpse of the sakura - cherry blossoms for Mother's Day. Their may only be a few to see but the sight will be a welcome one for us all. Just remember to respect the trees and don't break or climb them! Please respect the Sakura // Cherry Blossoms.